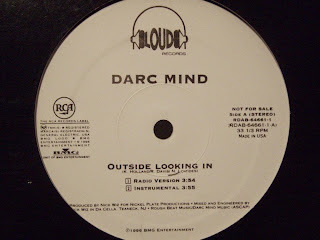 Long Island Rap Blog: Darc Mind - Outside Looking In 12"
Released on Loud Records in 1996, Outside Looking In was the first and only single Kevroc and X-Ray Da Mindbenda put out under the name Darc Mind. It's also the only Darc Mind song that isn't produced by Ray "X-Ray Da Mindbenda" Davis — Nick Wiz is credited as producer, mixer and engineer. Perhaps most notably, it contains the only known Kevroc acappella track, which is a jewel unto itself by virtue of the MC's vocal range. Stream that below and download the Outside Looking In 12" here.